The next page of my comics adaptation of “The Love Song of J. Alfred Prufrock” by T. S. Eliot (click on image to enlarge). Will Prufrock find the right words? Tune in next Monday to find out! This entry was posted in "The Love Song of J. Alfred Prufrock" by T.S. 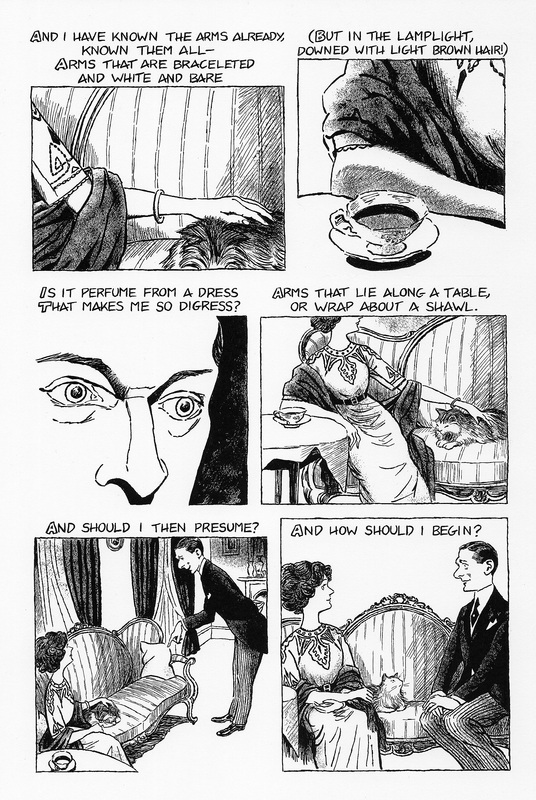 Eliot, comics, Poetry, Poetry Comics and tagged arms, comics adaptation, graphic novel, lamplight, T. S. Eliot, the love song of j. alfred prufrock. Bookmark the permalink. I need the earlier pages! Oh finish, please! I’m so ready to read the entire thing!